In my spare time, I’ve been playing a little more with the Windows 10 IoT Core build on Raspbery Pi 2. I’ve also got a Minnowboard MAX 2 but I seem to have settled on the Pi as the place to play. Is the preview OS/framework likely to be working? Is the hardware likely to be working? Specifically, with this LCD panel I was convinced that it was broken until at some point it ‘just started working’ and then, not much later, it stopped working again which has led me to think that my specific problem is around trying to hack up connections to it rather than solder them. Hence, a soldering iron is on its way to my house. It’s a long time since I had to solder anything but I spent a long time at stages 1,2,3 above before deciding that 3 was proving to be my specific problem with this device. In trying to figure out both the wiring and the protocol for talking to that LCD panel, I must have scanned 30-50 websites. There are examples of how to use this stuff everywhere. and many, many more including a lot of University websites where I scanned through various pieces of course materials around how to put these bits together. I installed Raspbian onto the device and tested out some Python code to see if that worked differently from my own. It didn’t, as it happens which led me back to suspecting my wiring. In the end, I decided that (however low level) it’s the Datasheet for the device that tells the true story and, for me, that involves skipping past a bunch of internal schematics that those documents have to find the information as to how to control a device from software. That was true for the LCD panel (datasheet) an also the Accelerometer (datasheet). 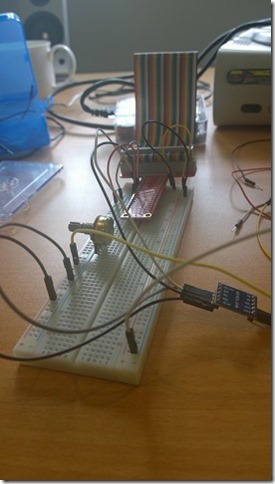 In both the case of the LCD panel and the accelerometer, I made an assumption that there wasn’t much Windows IoT Core stuff out there already and so it would be unlikely that I would find tutorials/articles on how to use those bits from Windows IoT Core. My approach then was to go off, do a bunch of figuring out, try things out and then when I got really stuck I’d do more and more specific web searches to see if I could identify a specific problem. way, way, way later than I should have given where they are located. While I wanted to follow a ‘start from scratch’ approach, both of these could have saved me a tonne of time and also provided verification that I was/wasn’t going in the right direction. In a spare 30 minutes this morning, I figured that I’d grab an accelerometer out of my SunFounder kit and see if I could make a connection to it. I hadn’t looked at I2C on Windows IoT before but I wired up the bits (around 3 minutes) and booted the Pi (2 minutes) and then I dropped into a new UWP project in Visual Studio. I figured that the I2C stuff would live in Windows.Devices and, sure enough, it does and I just used IntelliSense to try and figure out what the relevant classes were and within about 10 minutes I was at the point where I’d found my I2C device and opened up a comms connection to it. The rest was a matter of going ‘back to the datasheet’ to see what commands it supported and how they were supposed to be sent back/forth. which I merged into the code that I was writing, probably giving me a 10x speed-up in terms of figuring out how commands/data get sent to/from that device using the WinRT classes. Within about 30 minutes I’d got data coming back from that accelerometer and displaying (in an ugly way) in a simple XAML form. So…just a few observations on playing around with these 2 pieces of kit from IoT Core – next steps will involve going back to that LCD with a soldering iron! Windows 10, IoT Core–Getting that 2 Row LCD Panel Working!